CoRoT-8b: At about 70% of the size and mass of Saturn, CoRoT-8b is moderately small compared to the previously known transiting exoplanets. Its internal structure should be similar to that of ice giants, like Uranus and Neptune in our Solar System. 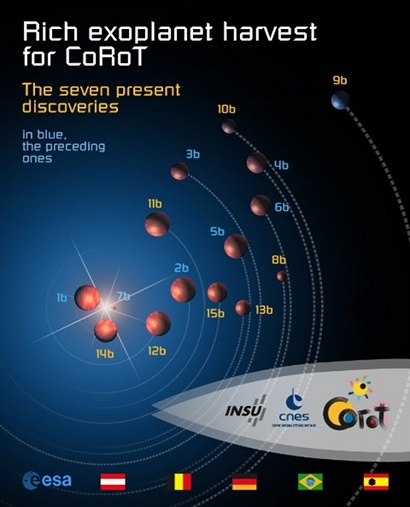 It is the smallest planet discovered by the CoRoT team so far after CoRoT-7b, the first transiting Super-Earth. CoRoT-10b: The orbit of this planet is so elongated that the planet passes both very close to, and very far away from, its parent star. The amount of radiation it receives from the star varies tenfold in intensity, and scientists estimate that its surface temperature may increase from 250 to 600°C, all in the space of 13 Earth-days (the length of the year on CoRoT-10b). CoRoT-11b: CoRoT-11, the host star of this planet, rotates around its axis in less than two days. For comparison, the Sun's rotation period is 26 days. It is particularly difficult to confirm planets around rapidly rotating stars, so this detection marks a significant achievement for the CoRoT team. CoRoT-12b, 13b and 14b: These three planets all orbit close to their host star but have very different properties. Although CoRoT-13b is smaller than Jupiter, it is twice as dense. This suggests the presence of a massive rocky core inside the planet. With a radius that is 16 times larger than the Earth, CoRoT-12b belongs to the family of 'bloated hot Jupiters', whose anomalously large sizes are due to the intense stellar radiation they receive. Amazingly, CoRoT-14b which is even closer to its parent star has a size similar to that of Jupiter. Its mass is 7.5 times the mass of Jupiter making the planet 6 times denser. Such a combination, very massive and very hot, is rare and CoRoT-14b is the second such planet discovered so far. CoRoT-15b: the brown dwarf. CoRoT-15b's mass is about 60 times that of Jupiter. This makes it incredibly dense, about 40 times more so than Jupiter. For that reason, it is classified as a brown dwarf, intermediate in nature between planets and stars. Brown dwarfs are much rarer than planets, which makes this discovery all the more exciting. The figure above depicts the relative sizes and distances from parent stars of the CoRoT exoplanets.